The Woodlands is a National Historic Landmark District on the western banks of the Schuylkill River. A private cemetery surrounds an imposing mansion recognized as one of the earliest and best examples of the federal style in this country. Renowned Philadelphia lawyer Andrew Hamilton purchased the 250-acre tract that would become the Woodlands in 1735. 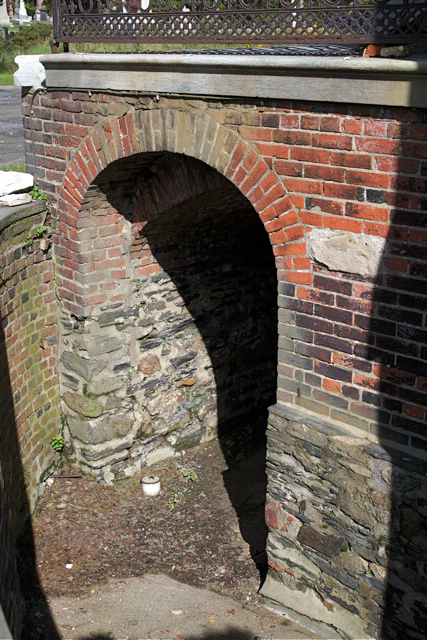 His grandson William inherited this land in 1766 and built a Georgian-style mansion with a grand, two-storied portico overlooking the river above Gray’s Ferry Bridge. He later doubled the size of the dwelling into a 16-room manor with kitchens and service rooms in a windowed ground floor. 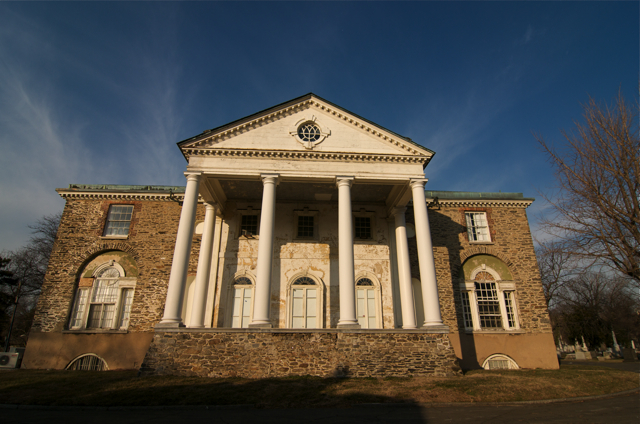 The rebuilt Woodlands mansion became one of the greatest domestic American architectural achievements of the 18th century, and a leading example of English taste. 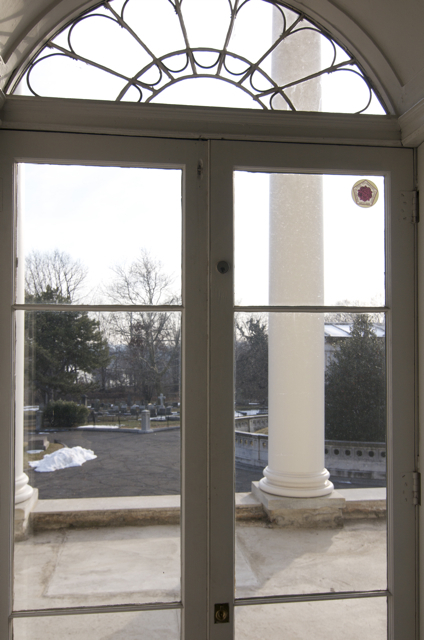 Hamilton was an active botanist, and his estate and greenhouses grew to contain more than 10,000 different species of plants including the first specimens of the Gingko biloba introduced into America. Following Hamilton’s death in 1813, his heirs sold off much of the Woodlands estate for institutional and residential development. In 1840, The Woodlands Cemetery Company of Philadelphia purchased the last 92 acres (370,000 m2), which included the mansion, outbuildings and extensive plantings. During this period the “Garden” or rural cemetery was becoming a popular alternative to crowded and unhygienic urban burying grounds. Rural cemeteries were usually non-sectarian and were distinguished for their use of diverse and elaborate landscaping and architecture. By mid-century, Woodlands was thriving and attracted many of Philadelphia’s renowned industrialists, medical professionals, artists, writers, and veterans. 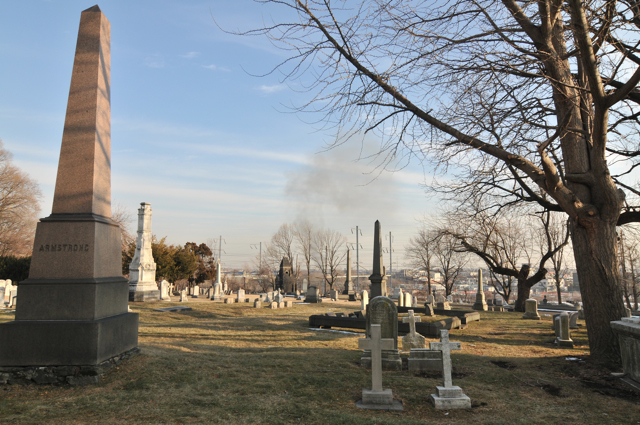 The Woodlands Cemetery Company of Philadelphia continues today as a non-profit cemetery corporation that promotes both traditional and current burial practices on its 54 acres (220,000 m2) of land in University City. 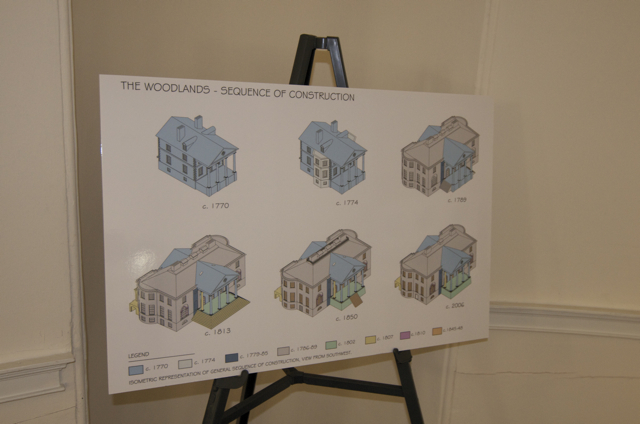 It is supported by The Woodlands Trust for Historic Preservation, a non-profit corporation, dedicated to the preservation and promotion of the cemetery, mansion, and arboretum as a cultural landscape. The Woodlands estate was designated a National Historic Landmark in 1968. The University of Pennsylvania students and administration, University City District, Woodlands Cemetery Company, UC Green, University of Pennsylvania School of Veterinary Medicine, Veterans Affairs Medical Center. The West Philadelphia community uses the site for passive recreation on daily basis. 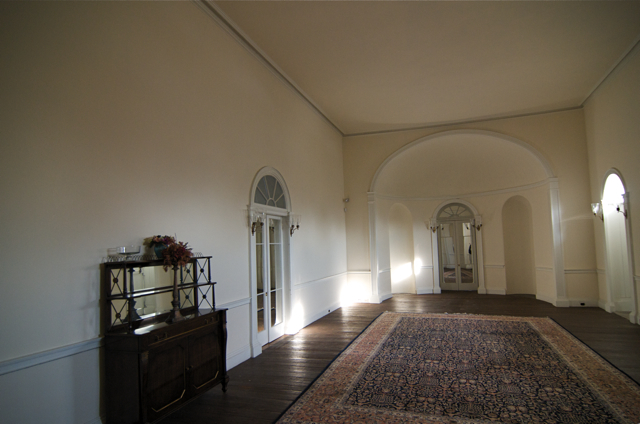 The Woodland’s dining room is the largest room in the mansion, and the most restored, and could accomodate a wide range of installation and performance work. 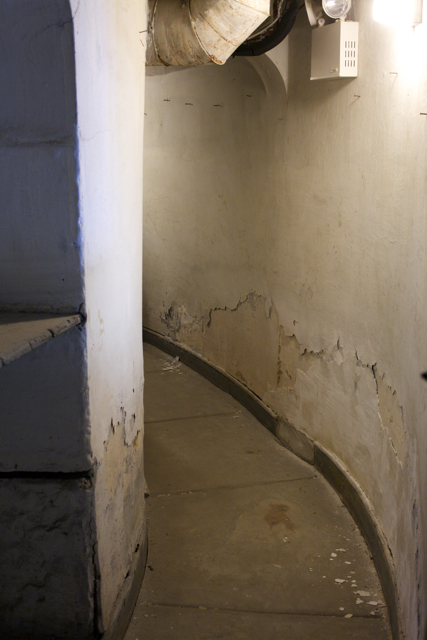 The servants’ quarters in the basement could also be used. 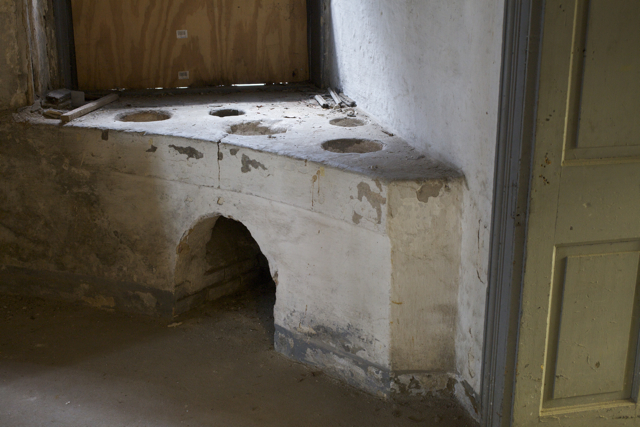 These spaces have not been restored, and have been altered substantially by the addition of various plumbing and heating apparatus. 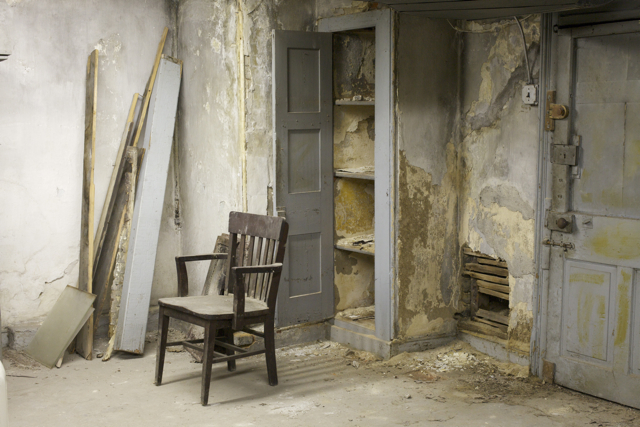 The largest of these basement rooms contains a primitive stove and wash basin. 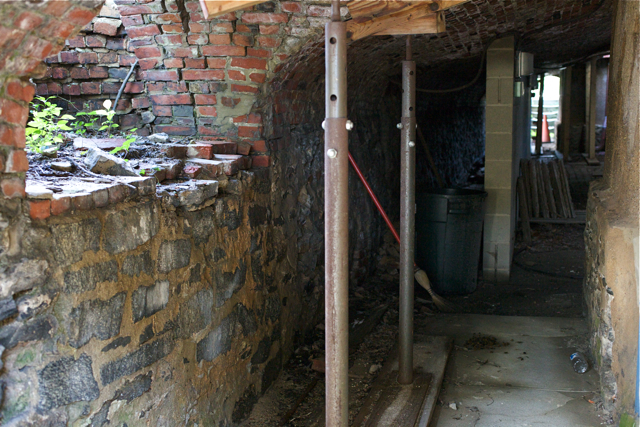 Further, there is a cryptoporticus, or covered passageway, that servants used to move about the property without being seen by the Hamilton family and their visitors.